Obituary – Crews, Mariella (Thompson) « Perry High School Alumni Association, Inc.
Y-Teen’s; Secretary of Homeroom ’46-’47; Library ’46-’47; Band ’43-’45. ﻿Mariella Thompson Crews, 63, long-time Perry resident, died at noon Monday, Sept. 6, 1993, at Perry Memorial hospital of complications from diabetes. Mrs. Crews had been ill for several months and had been a patient at Perry Memorial since last Friday. Graveside rites will be at 2 p.m. Thursday at Grace Hill cemetery at Perry under direction of Brown Funeral home. Lyell Thompson will officiate. A memorial has been established to benefit the American Diabetes association. Mrs. Crews was born Jan. 8, 1930, in Council Bluffs, Iowa, the daughter of Kenneth F. and Gladys Irene Thelma (Bowman) Thomson. She came with her family to Noble county in September, 1932, and lived on the Thompson farm, northwest of Perry. She attended Fremont school district 34 in Noble county and was a 1947 graduate of Perry high school. 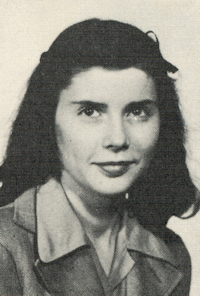 She attended Oklahoma State university in 1948-49, during which time she was chosen by national band leader Fred Waring as one of the three most attractive coeds on campus. She was married to Johnny Crews in the 1950. He preceded her in death. Mrs. Crews spent much of her life in her parents’ home and helped care for her mother’s long illness with Parkinson’s disease. She was a member of the First United Methodist church of Perry. Survivors include her father, Kenneth Thompson, Perry; and four brothers. Jack Thompson, Perry, Lyell Thompson, Fayetteville, Ark., Donald Thompson, Farmington, N.M., and Gene Thompson, Seagraves, Texas.